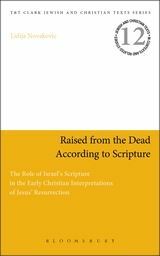 I was very excited to receive this book in the post yesterday: Raised from the Dead According to Scripture: The Role of Israel’s Scripture in the Early Christian Interpretations of Jesus’ Resurrection (T & T Clark, JCTS 12; 2012), by Lidija Novakovic (Baylor University). This monograph includes a foreward by James Charlesworth. Given the intensifying interest in the resurrection language and theology in the New Testament in recent years, I am curious to see what Novakovic adds to the discussion, especially from an intertextual point of view. I am especially interested in the “three-day motif” in the Gospels as well as how resurrection relates to Adam-Christ typology in Paul – both topics that this monograph treats. Looks interesting – looking forward to a review!